Welcome to this website containing the full text of history-of-medicine publications of Prof. Rabie E Abdel-Halim, Emeritus Professor of Urology and Kuwait Prize Laureate (2005 - History of Medicine). Links to the full text publications are distributed on the above listed pages (some are included in more than one category). Urology publications of Prof. Rabie E. Abdelhalim containing full text of some of his published articles on Urinary Stone Disease, Bilharziasis and Endourology. Medical Education publications of Prof. Rabie E. Abdel-Halim (full text). April 2015: The new page "Speeches and Presentations" has been added to the main domain. Check this link to have a look at its content. March 2015: In addition to the other pages in the main domain and subdomains of this website dealing with history of medicine, medical education and medical poetry, a seperate page on "Medical Humanities" is added for the author's articles on faith/science encounters and philosophy of medicine. To go directly to this page. please click here. December 2014: Correction of a dead link on the "History of Medicine in General Page". For the corrected link for Pericardial Pathology 900 Years Ago: A study and translations from an Arabic medical textbook, please click ﻿here. 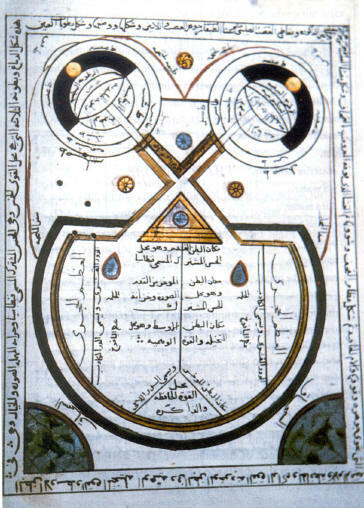 February 2014:'The Role of Ibn sina (Avicenna)'s Medical Poem on the Transmission of Medical Knowledge to Medieval Europe' a recently published article added to the "History of Medicine in General" page. January 2014: "Al-Zahrawi's Millennium Anniversary Blog" a new blog added to this domain. Three Pieces of Wisdom . 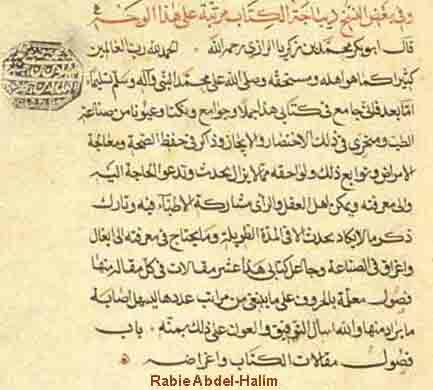 The beginning of the opening page of a manuscript of a book by Abu'l Hassan Ali Ibn Ridwan Al-Misri (998-1061 ِADِ) (“kitab al nafie fi kaifiaat taalim sinaat al tib”; The book of useful way of teaching medicine).